The white By Malina dress and white Gianvito Rossi shoes she wore for Prince Oscar's christening on May 27, 2016. I have to admit I'm not a huge fan of the Philip Treacy hat, however. I would love her to repeat her the H&M gown she wore at the Nobels in 2016! I loved the color and the shape of the dress. It looked so regal, and I loved that she paired it with pieces from the Cameo parure. My other choice is the Elie Saab dress she wore at a pre-wedding reception hosted by the Prime Minister in 2010. I love Elie Saab, and I love Victoria in Elie Saab so this was a perfect outfit for me. I loved everything about it. I loved her Fadi el Khoury gown from Madeleine's wedding. It's so dramatic with the embroidery, and I love the color, too. I would love to see it worn to a tiara event with the Connaught tiara. I'd also love to see her wear the outfit she wore to Gabriel's christening again. I love the color and the silhouette. It just WORKS on Victoria. I liked her newest Ida Sjöstedt floral dress that she wore for the Cambridge visit to Sweden earlier in 2018. Also, I liked Victoria's pastel Rodebjar suit with the Acne coat that she wore during the same visit from the Duke and Duchess of Cambridge. I want to see her repeat the light pink Heart dress she wore for the boat party during the celebrations of Prince Nikolaos and Princess Tatiana's wedding in 2010. I have no clue on the designer, but I want to see this navy gown again because it's never been seen before in public. I'm guessing designer is Pär Engsheden or Lars Wallin, but I have no confirmation. The Elle Saab gown she wore (and Victoria has worn) to her pre-wedding dinner in June 2013. The light pink, floral Fadi el Khoury bespoke gown for the 2016 Nobel Peace Prize. Like Brittani and Laura, I loved her Fadi el Khoury gown but since I don't want to repeat what was already said, I chose the black Carmen Marc Valvo gown she wore for the Swedish Chamber of Commerce gala dinner in New York in 2011. It's such a flattering gown and I loved it when she first wore it. Another dress I would like to see again is the Roksanda dress she wore at Prince Oscar's christening. I love Roksanda's designs and this one was no exception, Madeleine looked stunning and her styling was on point, especially her hair ! Like Brittani, I'd like to see Madeleine wear the Fadi el Khoury gown from the 2016 Nobels. It's just the classic princess dress in my mind, and it's fabulous. Another one I'd like to see is the Valentino she wore to Nicolas's christening. It's so high fashion, and I love the gold and burgundy combination. I want to see Madeleine repeat the 2017 Victoria Day outfit: Erdem ‘Meg’ dress and Philip Treacy hat. It was a favorite of many, including me - I want to see her in the Fadi el Khoury purple gown from the 2014 Nobels and the tea party in 2015 with Min Stora Dag. I also want to see this dress again for the purpose of identifying it. The black and white patterned Gant dress that she wore on day 2 of her and Carl Philip's visit to Varmland on August 27, 2015. Sofia's outfit from her return to Darlana in October 2015; Zara black and white top, red Gant Collection coat, black Gant boots, Engelbert Diamond Hoop Earrings and black Longchamp bag. The red Ida Lanto Couture gown she wore at a gala dinner in March 2017. I really love the color, and it fitted her so well. I would love to see it again! Another gown I would like to see again is the white Alexis gown she wore at the gala dinner for King Harald and Queen Sonja's 80th birthdays in 2017. It was a really nice gown, different than what she usually wears, but I liked it a lot. My first choice is the Ida Lanto gown she wore to the 2017 Nobels. Like Madeleine's, this is a fantastic princess dress, and the shade of neutral is fantastic on Sofia. I also love her modified wedding tiara with pearls. I also chose the Zuhair Murad gown she wore to her pre-wedding dinner. It's so exquisite, and Zuhair Murad is one of my favorite red carpet designers. And again, the color looks fantastic on Sofia. My second outfit I want to see repeated is the black Ida Sjöstedt gown from her event a couple of nights ago to present awards for the UNDP. After the 2017 Nobels in Stockholm yesterday, we have selected our favorite looks from the evening (one of, if not THE most glamorous of the royal calendar). Sarah: The favorite for me was Sofia. I loved the style of her gown. I loved the details of buttons on the sleeves and how she kept the jewels matching, which complemented each other so well. I love how it was a muted lace material. I adored how it just flowed out and just looked so princess like. I haven't liked Ida Lanto's pieces for her in the past, but this was stunning. Also, I really loved the surprise of the pearls on the tiara. I didn't see that coming, so it was nice to see that they can still surprise us in the jewel department from time to time! Heaven: My favorite was Madeleine for the third year in a row! I'm not a big fan of the amethysts, but there's no one who wears them better than she does. I was pleased to see the whole parure, too. What made me love the look was how every little detail was tied together; it was so on point! The nail polish, the purple details in the lace of her dress, the hair (I love this kind of updo), the clutch matching the color of the skirt and the flowy skirt were all just so wonderful. I like that this is a real maternity gown, but it's not super fitted or a tent dress; it flatters her beautifully and the color looks amazing against her skin tone and with the amethysts. Laura: I loved Madeleine's look. The amethysts are a very beautiful stone but a tough tiara to wear. Madeleine wore them the best I've ever seen. I thought the Seraphine gown was exquisite. You can really tell that the brand is the master of maternity wear. I really loved how there were hints of purple in the gown to work well with the tiara, but it also contrasted, too. I love, love, love that she wore the amethyst necklace, earrings, and brooch with it! Finally, this feels like a really timeless look. I have a feeling 10, 20, etc. years from now I will look at this and still think it's stunning. Brittani: I expected to say that Princess Madeleine was my favorite. However, for the first time in a long time, I wasn't fond of her gown. I absolutely adored Princess Sofia's gown. It was gorgeous! It is definitely my favorite of hers so far during her time as a royal. The color might have been too pale for her skin tone but I think the overall gown made up for it. The lace and glitter design was so delicate and feminine. She kept her jewelry simple and let the dress do the talking. I also loved how she changed out the emeralds on her wedding tiara to pearls. To be honest, I like the tiara with the pearls better than the emeralds. I hope she chooses to wear the tiara like that more in the future! For Queen Beatrix of the Netherlands' 60th birthday celebrations, Sarah found that Queen Silvia for Nina Ricci on both nights. The celebrations took place on January 30 and 31, 1998, in Amsterdam. Those in attendance included Prince Alexander (the Prince of Orange), Prince Charles, King Harald and Queen Sonja of Norway, Queen Margrethe and Prince Henrik of Denmark, King Constantine and Queen Anne-Marie of Greece, King Juan Carlos and Queen Sofia of Spain, and Grand Duke Henri and Grand Duchess Maria Teresa of Luxembourg. On January 30, the festivities were held at the Muziek Theater where the Dutch Royal Family and other royal guests enjoyed a ballet performance where Silvia wore the glittering, snakeskin gown while carrying a matching silver clutch. Her gown was not revealed until she had gotten inside the theater due to the cold temperatures; she kept warm in her fur coat. On the evening of January 31, guests were treated to a gala dinner at the Royal Palace of Amsterdam. This palace is the working palace and not one where the then Queen of the Netherlands lived. Queen Silvia wore a purple Nina Ricci gown with diamond floral earrings. Her shoes were matching the gown, and Her Majesty kept warm in a long fur coat. On both occasions, King Carl XVI Gustaf was in black tie. This snakeskin gown she still wears to this day. For official photos released several years ago, Queen Silvia of Sweden wore a deep orange/rust Jacques Zehnder ballgown with her Order of the Seraphim sash. Two photos were released; one featured Queen Silvia with her husband King Carl XVI Gustaf while the other was a solo shot. Both are featured in this post. The dress, which is long sleeved and floor length, had rose embellishments around the neck and sleeves. It also had a full and flared out skirt in true queen fashion that you see in fairytales. It featured buttons, matching the gown's color, down the left side of the front of the gown. She accessorized with the Leuchtenberg sapphires that she has worn on many occasions, as well as the Leuchtenberg Sapphire Tiara. Queen Silvia had a rough birthday and Christmas this past year. While celebrating her birthday on December 23, she fell ill and was taken by ambulance to nearby Danderyds Hospital with Princess Madeleine by her side throughout the night. She was released in time for Christmas morning celebrations at home at Drottningholm Palace. The next time we saw Her Majesty was in a photo posted to the Swedish Royal Family's Instagram showing Queen Silvia and King Carl XVI Gustaf after a hike in the Swiss Alps on a family vacation with Princess Madeleine, Christopher O'Neill, Princess Leonore, and Prince Nicolas. Silvia was seen enjoying the slopes alongside her family, and according to Sarah, she was wearing a heavy Bogner jacket with a fur hood lining. She was seen sporting the jacket for the entire vacation which was captured by many paparazzi and other guests. Princess Madeleine later shared four images of Princess Leonore and Prince Nicolas enjoying their vacation on her Facebook. The family also posed for photographers while in the Alps, but the King and Queen were not present during this time. 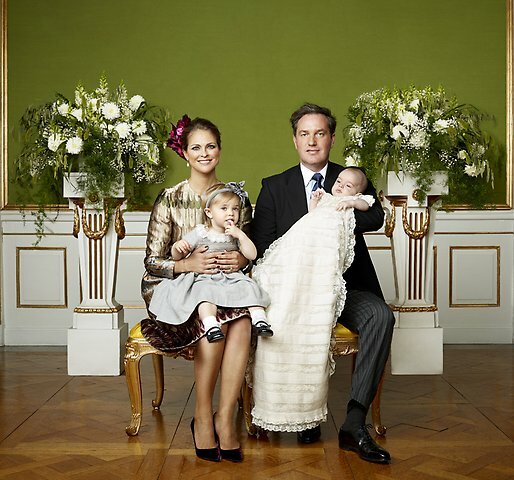 Princess Estelle, Duchess of Östergötland, was christened on May 22, 2012, at the Royal Chapel of Stockholm Palace. Our Editor-in-Chief, Sarah, found that Queen Silvia wore a blush-colored Valentino design for the religious ceremony. The top featured a beautiful lace peplum. She wore a short pearl necklace and pearl drop earrings with the outfit and a Jimmy Choo clutch to match the Valentino design she was wearing. Her Jimmy Choo shoes were matching in the same color. Princess Estelle's godparents were Prince Carl Philip, her maternal uncle; Crown Princess Mary, a close friend of her mother and for whom she was given one of her middle names; Anna Westling-Söderström, her paternal aunt; Crown Prince Haakon of Norway; and the then Prince Willem-Alexander - now King Willem-Alexander of the Netherlands. Like her mother, uncle, and aunt before her, she wore the traditional christening gown of the Swedish Royal Family which was first worn by Prince Gustaf Adolph at his christening in 1906. Her name was sewn in to the gown like her family before her. Her cousins and younger brother would follow when it came time for their christenings. Estelle Silvia Ewa Mary was born on February 23, 2012, at Karolinska University Hospital in Solna, Sweden. Sarah found that Queen Silvia of Sweden wore a baby blue Valentino dress to the christening of Princess Leonore of Sweden, Duchess of Gotland. Princess Leonore, the elder child and only daughter of Princess Madeleine of Sweden and Christopher O'Neill, was christened on June 8, 2014. This also happened to be the 1st wedding anniversary of her parents. She was baptised in the Royal Chapel of Drottningholm Palace with Anders Wejrd, the Archbishop of Sweden. Her godparents were Crown Princess Victoria, maternal aunt; Tatjana d'Abo, paternal aunt; Patrick Sommerlath, mother's maternal cousin; Count Ernst Abensperg und Traun, paternal uncle by marriage; Alice Bamford, friend of her parents; and Louise Gottlieb, friend of her parents. She wore the traditional christening gown for the family, which was first worn by Prince Gustaf Adolph (later King Gustaf VI Adolph) in 1906. Leonore was born on February 20, 2014, in New York City. By birth, she is an American citizen, as well as a Swedish citizen. Sarah has recently discovered that Her Majesty Queen Silvia of Sweden wore a pink version of Camilla Thulin's coat for King Carl XVI Gustaf's 70th birthday celebrations on April 30, 2016. The 5-day event brought in many foreign royals to celebrate including Queen Margrethe, Prince Henrik, Princess Benedikte, Crown Prince Frederik, and Crown Princess Mary of Denmark. Norway was represented by King Harald, Queen Sonja, Crown Prince Haakon, Crown Princess Mette-Marit, Princess Martha Louise, and her then-husband Ari Behn. King Juan Carlos, Queen Sofia, King Felipe, and Queen Letizia traveled from Spain. There were representatives from most of the world's reigning and non-reigning monarchies. Queen Silvia wore the light pink Camilla Thulin coat during the balcony appearance at Stockholm Palace and during the changing of the guard ceremony that day. This is also the time each year, in celebration of his birthday, whenThe King receives flowers from children and a twenty-one gun salute occurs.